(Nanowerk News) Most life on earth depends on the sun to provide the energy needed to sustain its function. For more than a billion years, photosynthesis—a mechanism that has evolved to perfection—has allowed plants to convert solar energy into chemical energy. Solar energy is by far the most abundant source of renewable energy available to us. Aiming to reproduce this highly efficient process of energy generation in bid to meet ever-increasing energy demands, researchers have begun building artificial photosynthetic reaction systems based on principles similar to those found in nature. Now, a team of researchers from the RIKEN Advanced Science Institute in Wako and the University of Michigan, USA, has developed a quantum physical model that accurately describes the function of these artificial photosynthetic systems, and provides an understanding of their reaction kinetics that could lead to significant improvements in their conversion efficiencies ("Modeling light-driven proton pumps in artificial photosynthetic reaction centers"). Emulating plants to harvest solar energy has enormous potential. According to Franco Nori, who leads the team, about 10,000 times more solar energy reaches the surface of the Earth than humankind currently consumes. Figure 1: Emulating natural photosynthesis. Photosynthesis occurs in the green chlorophyll pigments found in leaves. As shown in the overlay, an artificial photosynthesis reaction system is based on a molecular triad composed of a donor (D), photosensitive part (P) and an acceptor (A). A shuttle molecule (S) transfers charges across the system. Plants convert solar energy based on a cascade of chemical reactions. First, light is absorbed by a photosensitive molecule, chlorophyll, which then creates a pair of positive and negative electrical charges. As these charges become separated, a number of consequent reactions lead to the transport of a proton from one end of a thin membrane to the other. This establishes a concentration difference. The electrochemical energy stored as a result of this separation is then transformed into chemical energy through the conversion of the molecule ADP to ATP. ATP carries the energy that powers almost all biological processes in the cell. Artificial photosynthetic systems are based on similar reactions, but consist of three different molecules placed within a membrane similar to that found in plant cells (Fig. 1). The artificial photosynthesis process studied by Nori’s team works as a proton pump in which protons are shuttled from one side of a thin membrane to the other (Fig. 2). This creates an electrical potential that can then be used for chemical reactions. In the system investigated, a photosensitive molecule absorbs light and separates the charges at both ends of the triad. A shuttle molecule collects the negative charge from the acceptor molecule, along with a proton from the outer end of the membrane. The shuttle then drifts towards the other end of the membrane and unloads its electron so that it compensates the positive charge on the donor molecule. Similarly, the proton is deposited from the shuttle molecule across the inner end of the membrane. Eventually, the empty shuttle molecule drifts back to its origin ready to restart the process. As a consequence, similar to natural photosynthesis, protons are transported from one end of the membrane to the other, which allows the conversion of ADP to ATP. The overall conversion efficiency of the artificial structures is about 4%, which is half of the efficiency of the natural process. Figure 2: The proton pump. Protons are transferred from the outside (right) to the inside (left) of a membrane through a number of steps. Working from top to bottom, the molecule (P) in the ground state absorbs light, which leads to the separation of positive and negative charges to the donor (D) and acceptor (A) ends of the triad. The shuttle molecule (S) then collects an electron, e-, and a proton, H+, before diffusing across the molecule and transferring the electron to the donor, where it recombines with the positive charge. The proton finally gets transferred across the membrane. Theoretical modeling of the conversion process is important for further optimization of the system. To this end, the researchers developed a novel analytical model of individual process kinetics rather than relying on atomic simulations. This approach allows the researchers to reach a better understanding of the individual reactions. “We derived and numerically solved a system of master equations to describe the kinetics of the process,” explains team-member Pulak Ghosh. To adapt the theoretical model to experimental reality, the researchers included a number of predefined variables such as external light intensity. They then optimized the remaining variables to reach a state where the conversion efficiency of the system is optimized within these given experimental constraints. According to the researchers, these optimized theoretical results were very accurate and confirm experimental observations. “Our model arrives at a correct prediction for the quantum efficiency of the proton pump,” says team-member Anatoly Smirnov. Observation of the interplay between the different processes and careful analysis of the results reveal design deficiencies in the artificial system. In particular, the proton pump process saturates at light intensities that are lower than the standard intensity from the sun, meaning that not all incoming light is harvested, note the researchers. The model can also be used to study novel artificial devices with a view to improving their performance. For example, Nori and his colleagues are investigating systems designed to directly convert light energy into an electrical current rather than using the indirect method of proton separation. Furthermore, Nori believes that light-harvesting antennae could be added to the molecular structure to collect the solar energy more efficiently and then channel this energy directly to the reaction centers. Despite numerous advances in artificial systems, nature still has much to teach us. 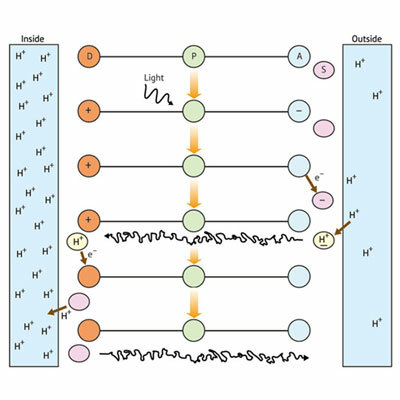 “We will also analyze mechanisms of proton pumping in natural biosystems … with the goal to apply this knowledge for the creation of efficient and powerful artificial light-induced proton pumps,” comments Nori. While it is remarkable that artificial systems have already achieved a light-conversion efficiency that, if optimized, is not too different to biological systems, use of molecular triads in large-scale technological applications remains a challenge. However, the results from this theoretical investigation into the kinetics of the fundamental processes of this artificial system will provide a strong basis for the further exploration of biological processes. Ultimately, this could provide a very efficient blue print for harvesting renewable energies based on nature’s own recipe.